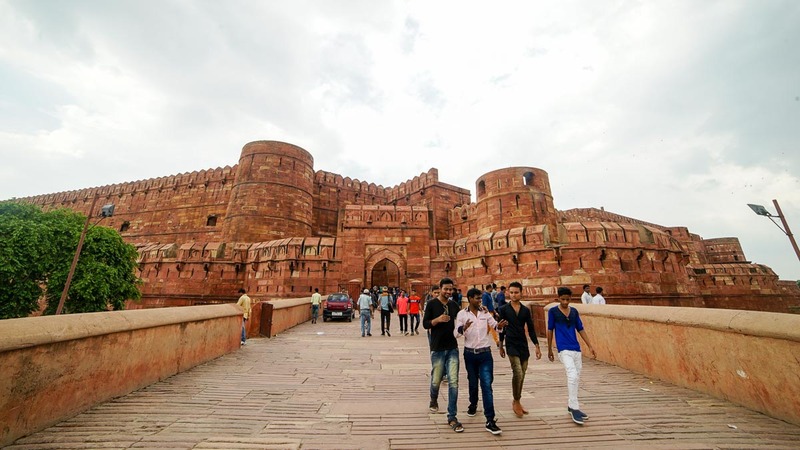 There are a few famous routes travellers normally take in India when they visit for the first time — The most famous is the Golden Triangle (Delhi, Agra, Jaipur) and a close second is the heritage arc (Agra, Lucknow, Varanasi). 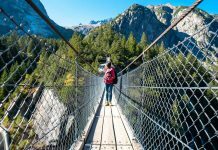 This itinerary will combine the best of both routes to minimise travelling time and maximise your 1 week experience in the land of adventures. To be frank, Delhi didn’t leave a great first time impression but that set us up for a pleasant surprise with every subsequent city we explored. 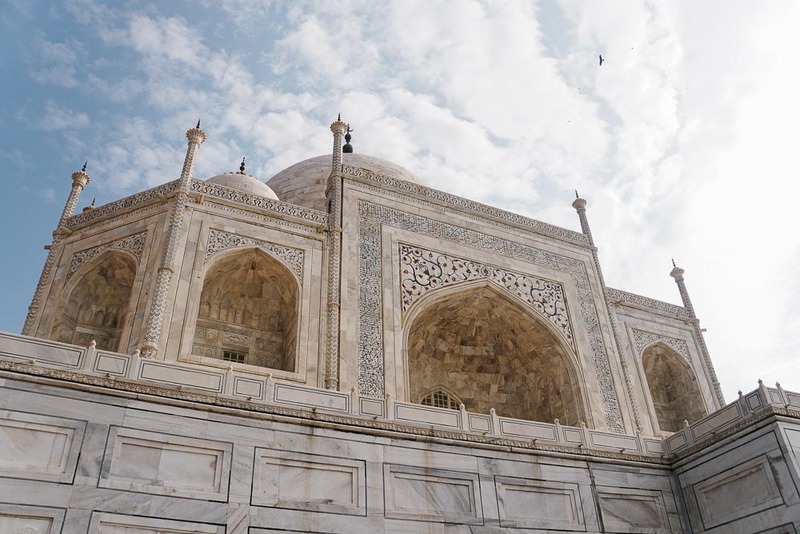 Some of my top favourites are the colourful palaces of Jaipur, the intricate labyrinth in Lucknow, the charming river life in Varanasi and of course, what’s a first trip to India without checking out the Taj Mahal in Agra right? Each city is distinctly different and I think that’s one of the most charming things about travelling through India. Even after covering almost 10 cities, I still feel like there’s so much more of India to discover. Visa: Apply at least a week ahead at the BLS International Service Centre at International Plaza or 48 hours before on the E-visa website. You will need to show your visa when checking into accommodations so a printout of the E-visa is essential. Currency: Change your Rupees before leaving as ATMs might be hard to find in these cities. In Singapore, you can get pretty good rates for Rupees either at the Arcade, City Square Mall or Mustafa. Flights: Fly direct from Singapore to Jaipur via Scoot; on the return, fly from Lucknow to Singapore. Accommodation: Zostel Hostel (₹499/night) — clean and cosy hostel located within walking distance to the Hawa Mahal and City Palace. 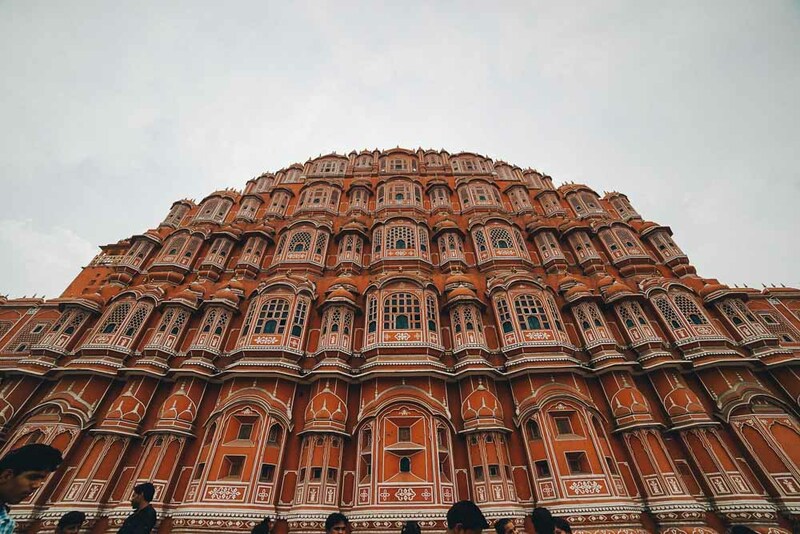 Commonly known as the Pink City, Jaipur was once painted entirely in Pink to welcome the Prince of Wales — pink was regarded as the colour of hospitality. Till today, it’s photogenic forts and palaces still make it a bucket list city for travellers visiting India. First stop the next morning, we hopped on an Auto and started our day from the furthest site. A 20-minute ride on the Auto brought us to one of the most photographed forts in Jaipur. 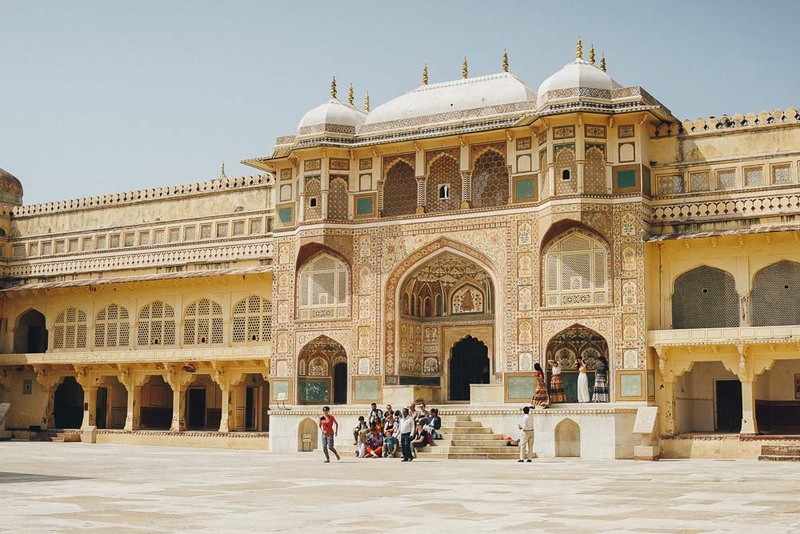 A blend of Rajput and Hindu style architecture, Amber (or Amer) fort has no shortage of photogenic walls to bring home pictures of — it’s probably the main star attraction of Jaipur. A popular way to enter the fort is on the back of an elephant (only available till 11am) but there’s also a stairway that leads straight to the main palace. 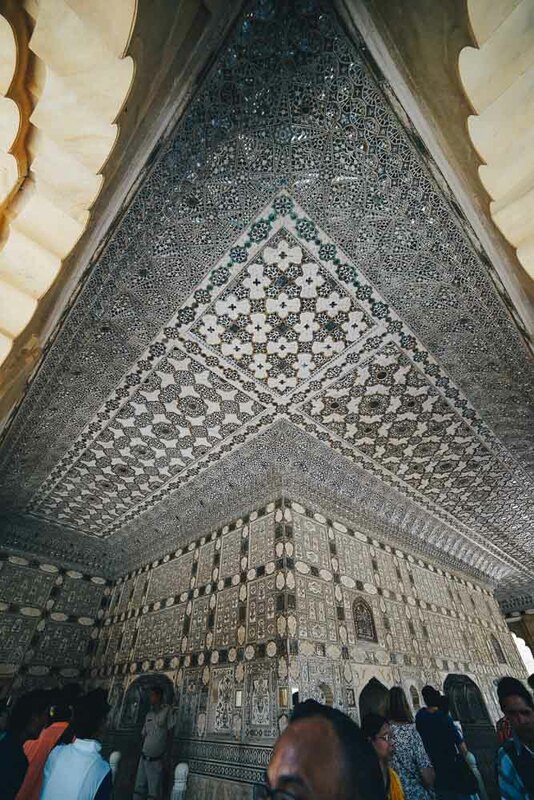 Definitely keep a look out for the intricate mirror palace, the rooms of the kings and the view from palace overlooking the gorgeous city. There’s also a popular light show that takes place every evening. The 50-minute show runs in both Hindi in English and explains the history of Jaipur. *Pro-tip: On the way back to the city palace, ask your auto driver to stop by Jal Mahal (translates to Water Palace) — a palace built in the middle of the lake. Built as an extension to Jaipur’s city palace, Hawa Mahal was specially designed for the royal ladies of the palace. The little windows were designed such that the royal ladies were able to watch processions or regular street life without being seen by the public. You can step inside to look through the eyes of the royal ladies in the past but if you’re short on time, you can snap a good picture from the outside for free. Astronomy fans will find this an interesting stop. 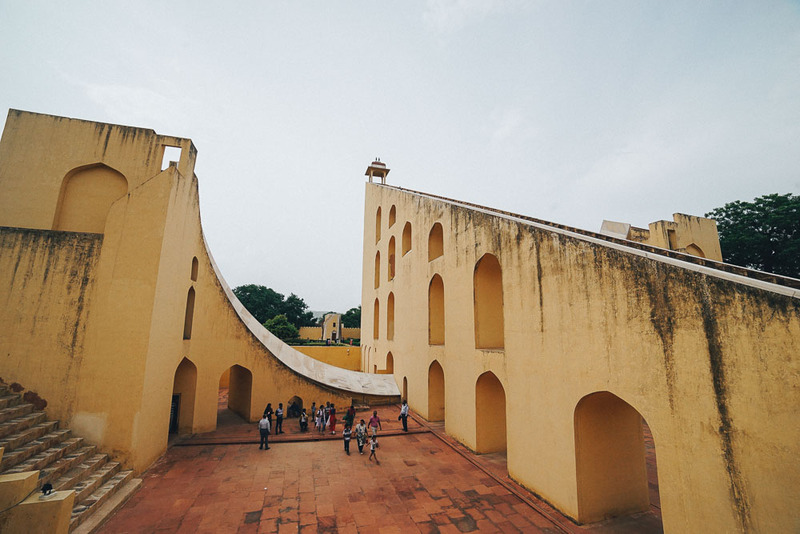 Built in the early 18th century, the Jantar Mantar houses some of the most comprehensive and best preserved astronomical instruments in India. Look out for the world’s largest sun clock (said to be accurate up to 20 seconds) as well as the individual structures meant to spot the constellations of the stars throughout the year. We highly recommend getting a guide here (~₹100) to hear about all the cool features. This fort has an interesting backstory — when it was first under construction, the workers would find their previous days’ work destroyed every morning. It wasn’t until they built a shrine where the spirit was believed to rest where they could finally complete the fort. Look out for a gorgeous view of the city from one of the fort’s windows. Entry to 8 sights including all of the ones mentioned above are covered by a 2-day composite ticket (₹1000; ₹200 for students)* which you can purchase at any of the sights. *The price seems to jump every year (it started at ₹500 back in 2016) so double check the website to be sure. 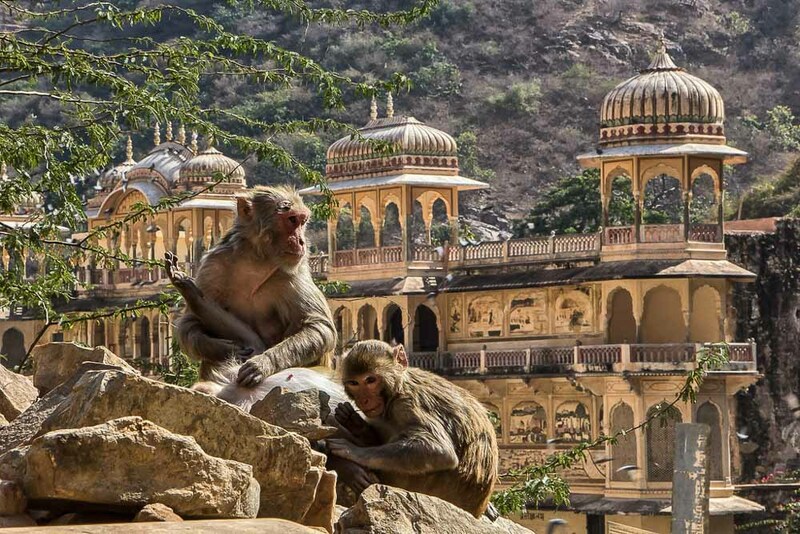 If there’s enough time, check out the Galta ji or more commonly known as the Monkey Temple. The majestic architecture made out of pink sandstone, intricately carved pillars and rounded roofs is often mistaken for a palace more than a temple. The area receives natural spring water which fills up 7 water tanks which locals often use for their holy baths. Not to mention the cheeky monkeys that have also made the place their home. Be careful if have food on you; the monkeys can get a little too friendly. Plastic bags should also be stowed away in your bags. Just outside Jaipur — about mid-way to Agra — there’s a couple of interesting sights. You can arrange a private car (~₹8000 for a 7 seater) to visit these places and arrive in Agra by dinner time. If you’re travelling solo/in a pair, hop on the day trips organised by Zostel at more affordable rates while making new friends along the way! Rumoured to be one of the most haunted place in India, this turned out to be one of our favourite sights. Being 1.5 hours away from Jaipur, you will hardly see any tourists in the compound. The interior of some building are quite poorly maintained are will reek of bat poop so having a scarf when walking through might be handy! An hour east from Bhangrah fort towards Agra, you can request to stop by this step well located in the Abhaneri village. 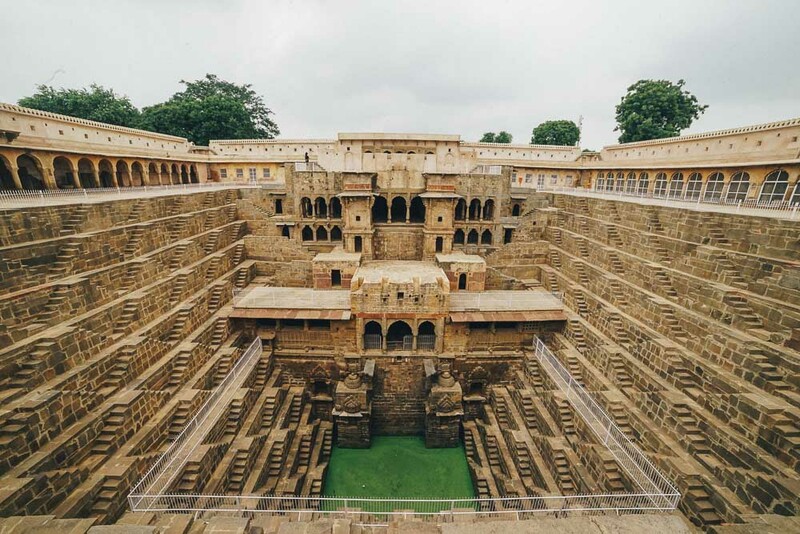 Built between 800–900AD, this is one of the grandest and most well preserved step wells in the Rajasthan area. This was also the site where Batman was filmed. Despite being out of the way, this seemed to be a lot more crowded with local tourists than the haunted fort although still a great place for a quick picture. *Pro-tip: If you’re staying at Zostel, ask the reception for delivery menus. 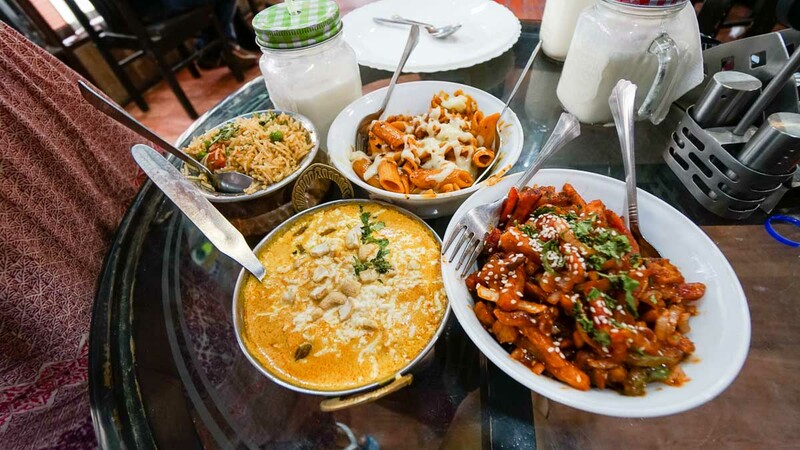 There are various restaurants nearby that will deliver straight to the hostel so you can enjoy your meal in the comfort of the hostel’s kitchen. 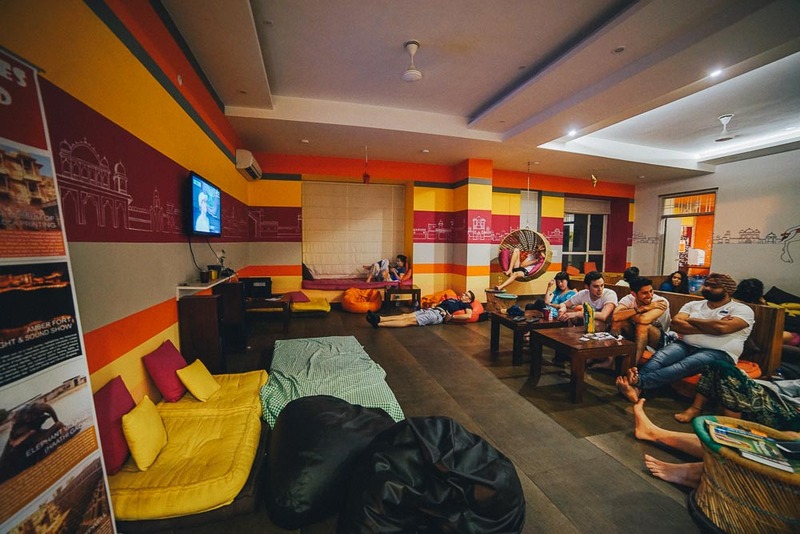 Accommodation: Zostel hostel has various branches around India so after a good experience in Jaipur we decided to check into Zostel in Agra too. The design isn’t quite as modern but still cosy and within walking distance to the East gate of the Taj Mahal. 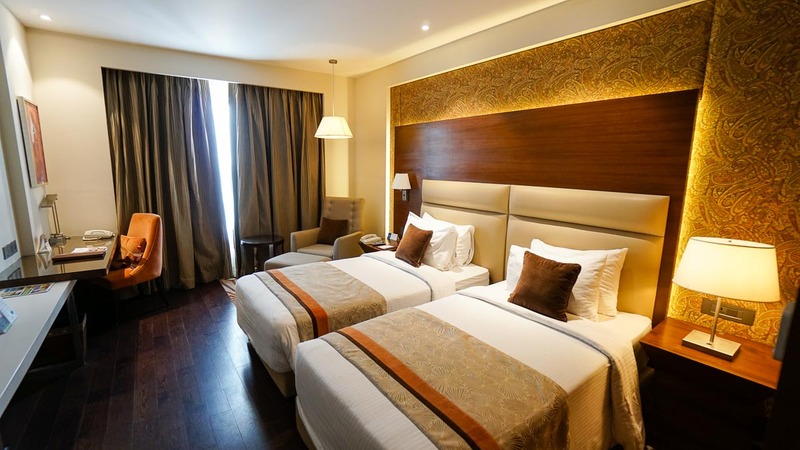 A more upscale accommodation is the Crystal Sarovar Hotel. 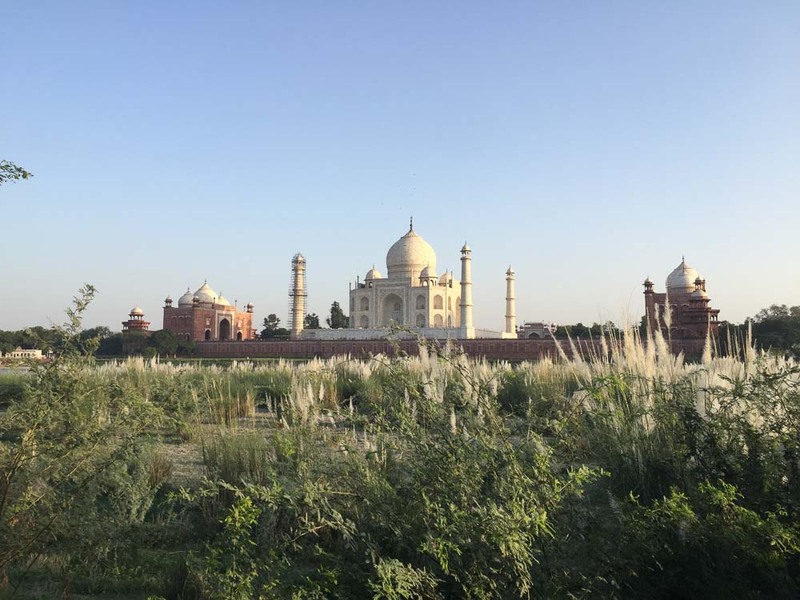 This 5-star hotel isn’t within walking distance to the Taj Mahal but has a spectacular view of it from the window and was honestly very reasonably priced from ₹2900 (~S$60). 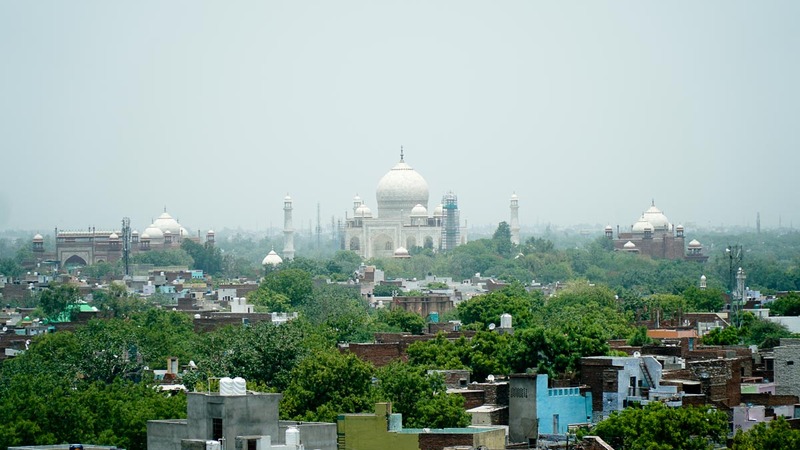 Home to many Mughal-era buildings, the main attraction of Agra really is the Taj Mahal. 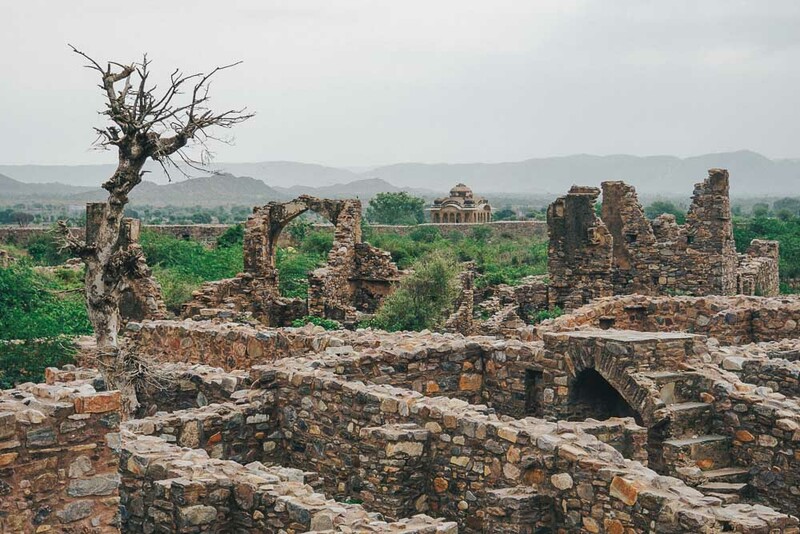 While some travellers visit Agra on a day trip only to check the Taj off the list, we got pretty intrigued uncovering some of the other historical sites. 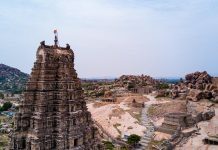 We usually save on tour guides and prefer reading up on history beforehand but information on some of these places can be a little hard to find — we’ve also learnt to be a little skeptical when reading information online especially when it comes to India. For just ₹100-300/guide, I think it’s well worth getting more context and perspective on a city like Agra. If you’re a history buff, you’d want to make a stop at Fatephur Sikiri first before the Taj Mahal just to get a sense of the timeline in Indian history. 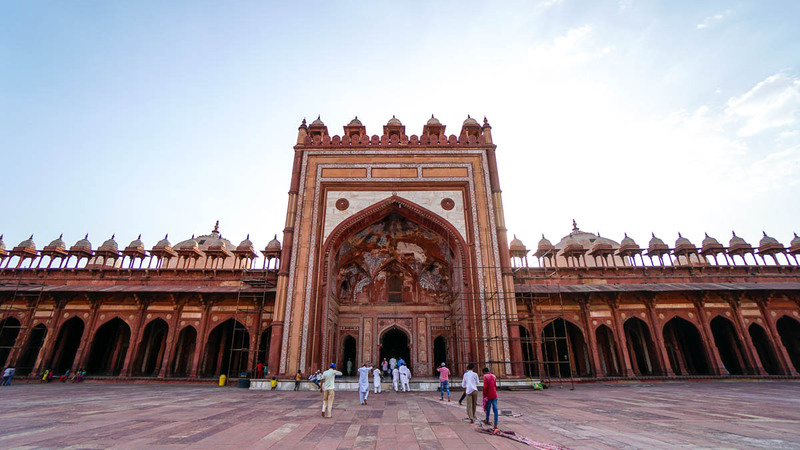 Located about an hour away from Agra, Fatephur Sikiri is a UNESCO World Heritage site that was built by Akbar — Grandfather of Shah Jahan (the creator of the Taj Mahal). 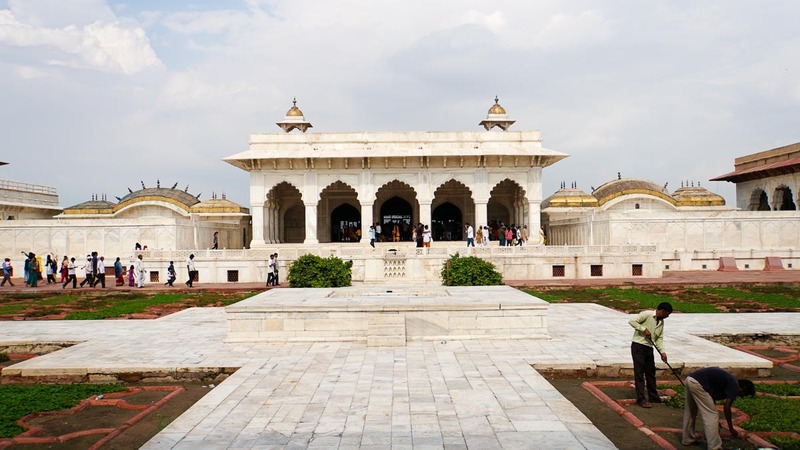 Akbar was known to have hundreds of wives (some sources say 200, others say 300) but probably 3 of them were his favourite — a muslim, a christian and a hindu — who each had a palace within the walled up city of Fatephur Sikiri. Because of that, the entire compound was designed with distinct religious elements, often merged on a single column or wall. On the way back from Fatephur Sikiri, ask the driver to make a stop at the Mehtab Bagh, just in time for the sunset. This garden across the river of the Taj Mahal is probably the most iconic place to catch a view of the Taj. Make sure you insist on a ticket after paying at the entrance or the guards will conveniently not issue it and ask you for it when you exit. 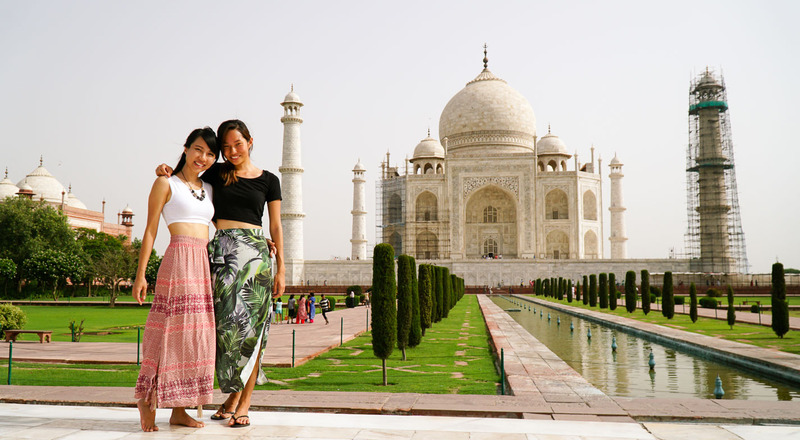 The reason why we didn’t visit the Taj Mahal on the first day is because the Taj is truly more spectacular during sunrise — The crowds are lesser, the air is cooler and the sun isn’t as harsh — especially important when walking on the white marble tiles. Try to bring as little items as possible as the bag checks are quite strict. Some of the common contraband items to note: Tripods, batteries (Even those hidden in your torchlight! ), portable chargers, lighters, food. Being a 7 wonder of the world, the Taj Mahal is pretty crowded all year round so you’ll need some patience if you’re looking to get that perfect shot of the Taj Mahal without photo-bombers. For more photography tips, check out the Taj Mahal Photography guide for beginners. *Pro-tip: Retain your ticket from the Taj Mahal to get a discounted ticket for Agra Fort. 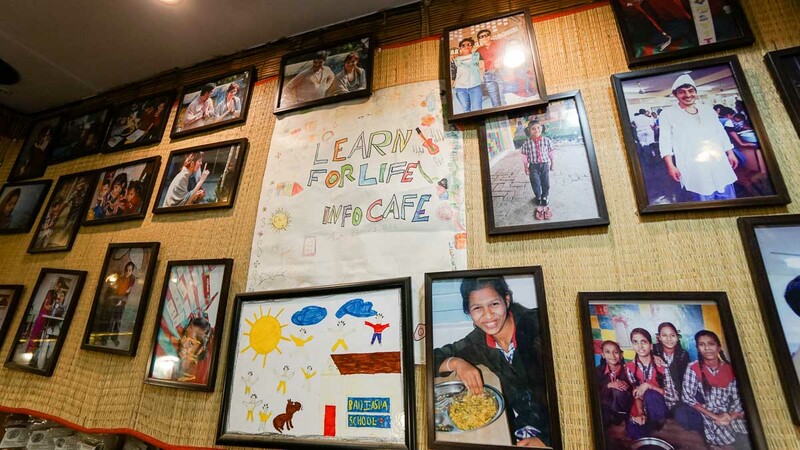 A great place for lunch in Agra, Sheroes Hangout is a social project started to support the victims of acid attacks. Meals here are pay as you wish and while it may take some time to serve (they’ve improved since we first visited in 2014), we loved the vibe and the food was pretty good! 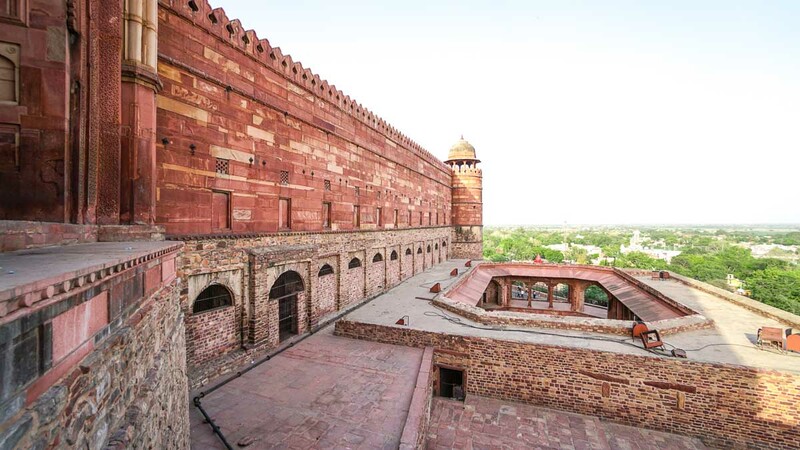 Just before the capital was shifted from Agra to Delhi, Agra fort was where the emperors of the Mughal emperors lived. From Akbar, to his son Jahangir and finally his grandson Shah Jahan — who went on to build the Taj Mahal we know today. I’ve always found forts around the world an interesting insight to the different cultures; how the entrance was a slope which had slits down the sides of the walls so hot oil and metal balls could be released when the enemy tried to enter. This was because the main mode of war transport in the past was with elephants and the elephants would not be able to ascend the slope with these defence mechanisms in place. *Note that the prices even on government websites like Agrafort.gov.in does not have updated prices of the tickets. 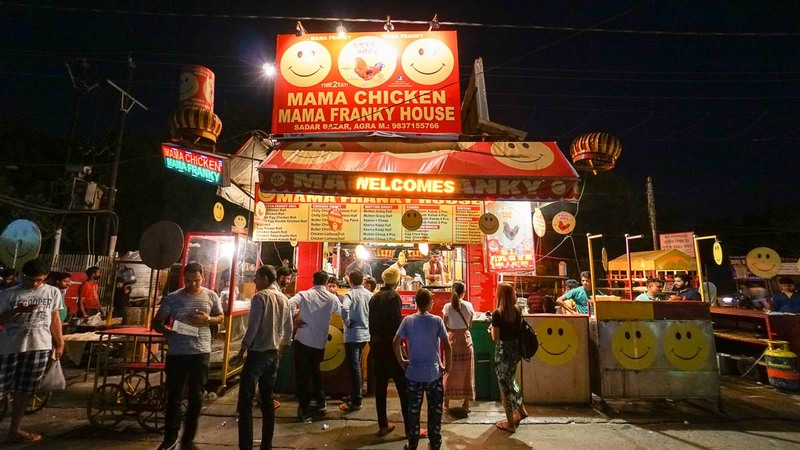 Before leaving for your bus, grab a meal at Mama Chicken, a Dharba specialising in Kebab and wraps. They have an indoor restaurant area you can order your food from or you could walk up to the stalls and point to order whatever you like. 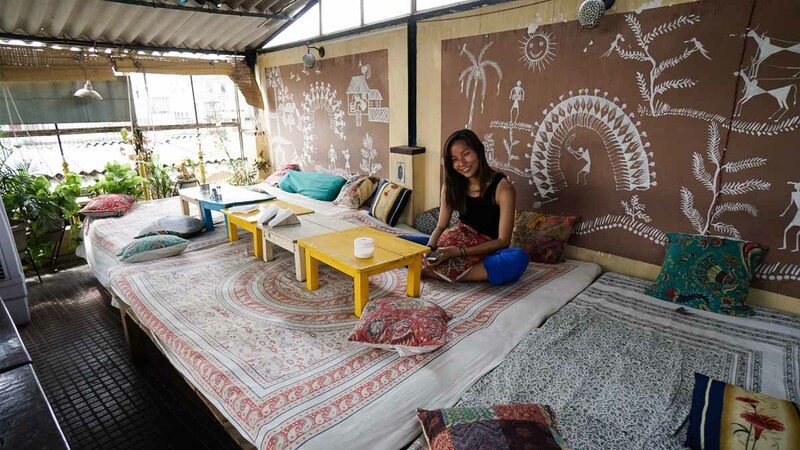 Accommodation: Hostel La Vie (₹349) — Colourful and cosy hostel with a view of the Ganga from the rooftop. Power cuts are quite common in this city and the aircon is the first to go. Varanasi turned out to be the highlight of our trip. 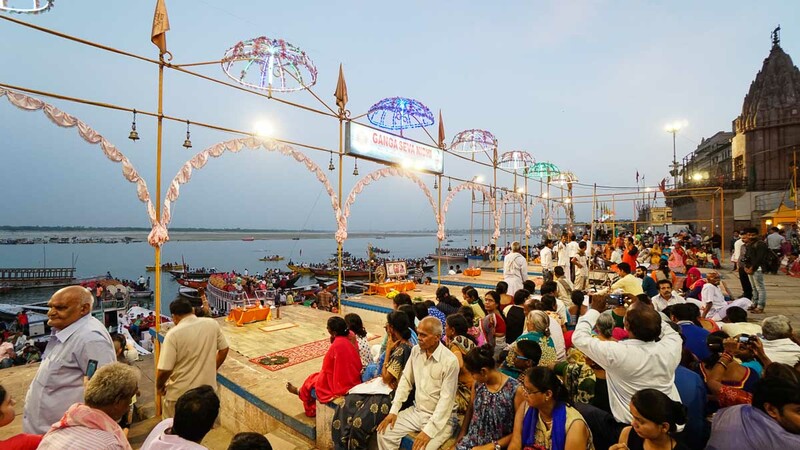 A famous pilgrimage stop to the local tourists, Hindus believe Varanasi is the most auspicious place to die as it offers a liberation from the cycle of life and death. 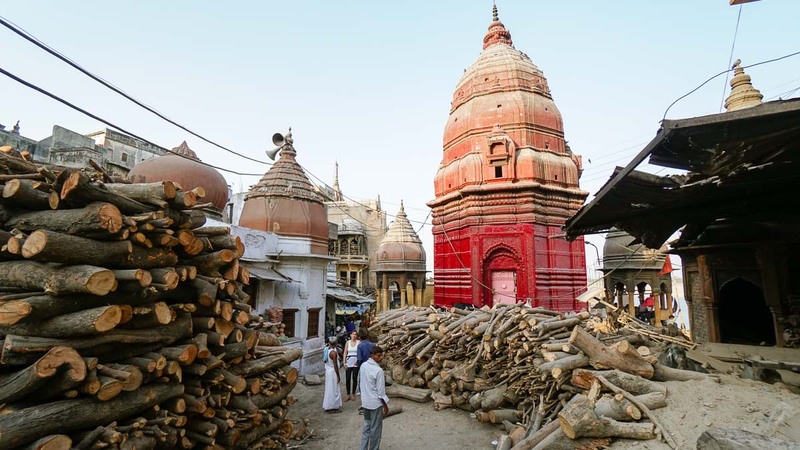 You’ll see later that some of the burning ghats are so popular there will be cremation ceremonies happening 24 hours. 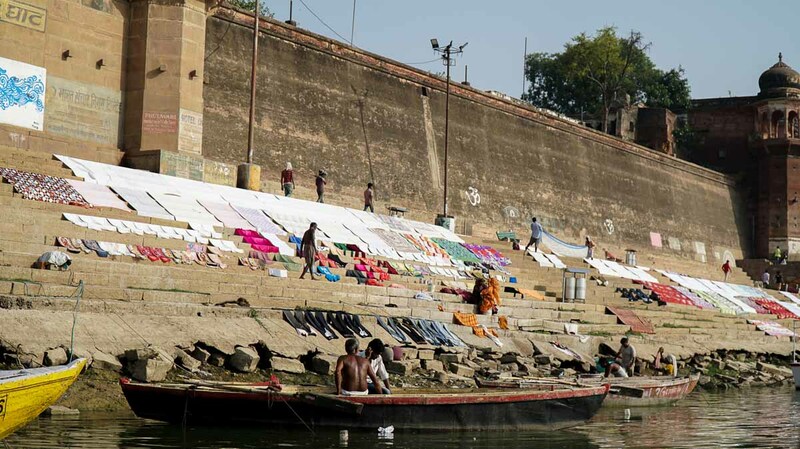 A lot of the life in Varanasi revolves around the Ganga river — dipping in it is believed to wash away your sins. 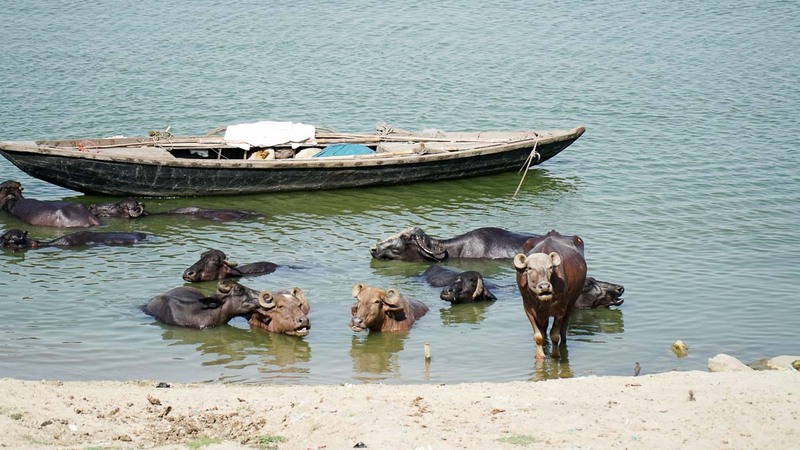 There are 88 ghats along the river and the best way to get a glimpse of life along the river is via a boat ride. From doing their laundry, to laughing yoga, to puja (prayers), the days here start as early as first light. Just walk down to the banks and you’ll probably get various quotes. We got ours for ₹300 but you might need to haggle a little more during the peak season from Oct – Nov. If you head down stream towards Manikarnika Ghat, you might catch some funeral rites going on. As intriguing as it is, put down your cameras here to respect the grieving families. After the boat ride, ask the boatman to drop you near the Manikarnika ghat to locate the Brown Bread Bakery — famous for its organic bread and wide variety of European cheese. 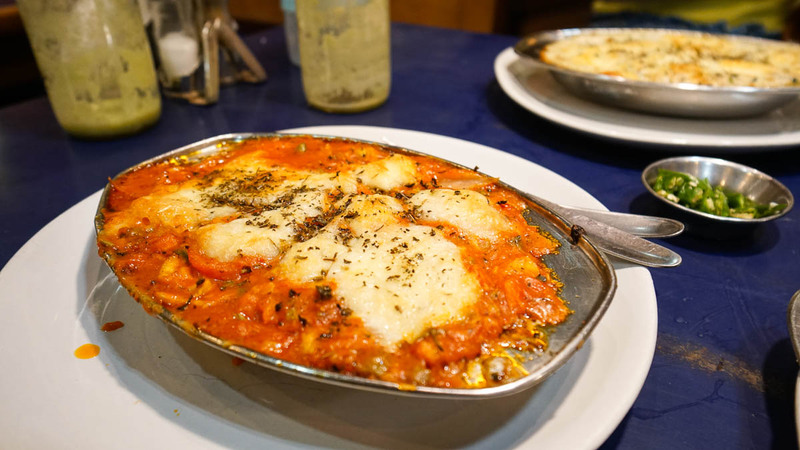 The lasagne and pasta options are all pretty good and part of the proceeds goes to the Learn for life charity. Easily recognised from the constant cremation smoke, your boat man will probably point this ghat out as you sail along the river. Up on the banks (if you decide to explore on land), the priest (or so they claim) will likely approach and offer to show you around. The explanation is pretty detailed but they expect a pretty hefty donation at the end (the price of wood for 1 human) so if you’re not keen, let them know early and you’ll be left to explore on your own. Just don’t take photos of the bodies burning. The grieving family will most likely not let you off if caught. 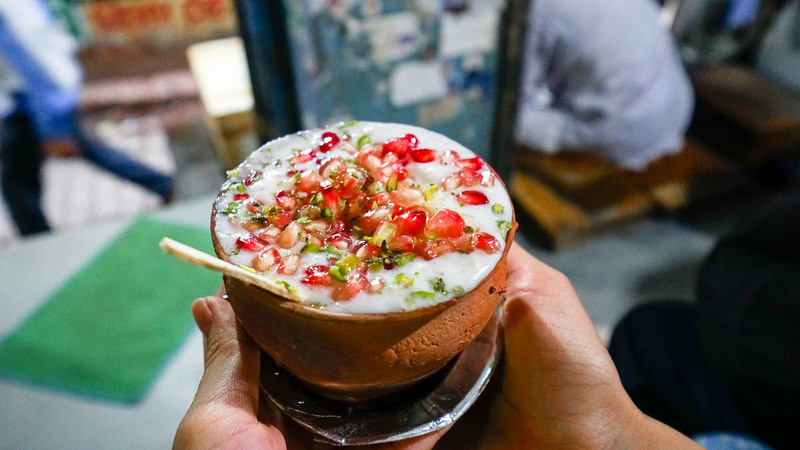 Not far from Manikarnika is a literal hole in the wall lassi shop that has earned its reputation for being the best lassi in Varanasi. The owner who got the recipe from his grandfather makes all the cups of lassi by himself. We even met travellers who visited the place everyday since they arrived in Varanasi. About an hour before night falls, save yourself a good spot at the Dashashwamedh ghat. The Ganga Arti (translates to fire ceremony) is a daily offering performed daily by group of priests to Lord Shiva and the mother Ganga. Varanasi has an absolutely chilled vibe and travellers with more time on their hands often find themselves staying longer than planned. 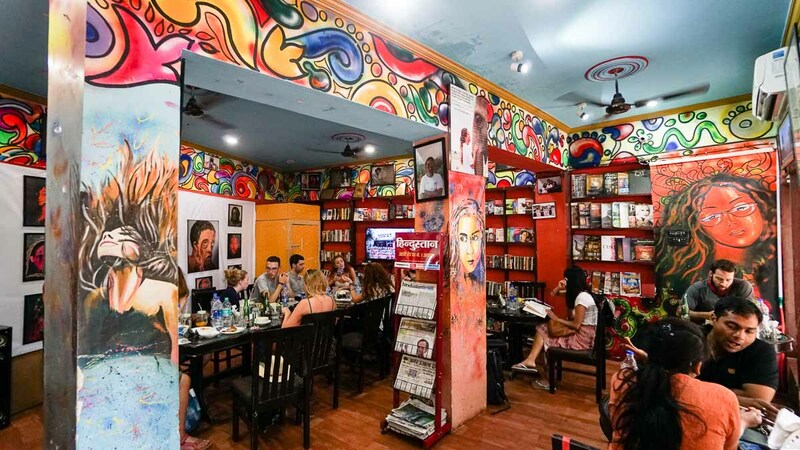 If time is on your side, stay a day or 2 more to discover the charming hipster cafes, yoga/dance/martial art lessons and maybe even a lassi store better than blue lassi. 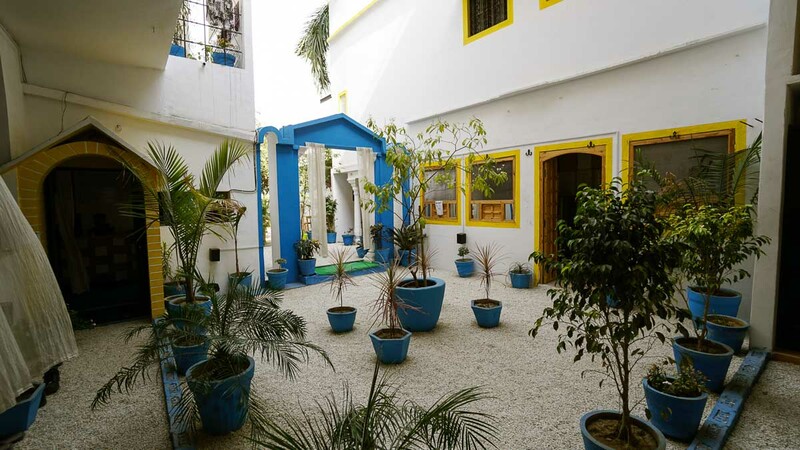 Accommodation: A popular option in Lucknow is the Lucknow Homestay (₹1000 for A/C room with ensuite bathroom) but the 6 rustic rooms get booked out pretty quick. We ended up in Hotel Arjuna International (₹2100 for an A/C deluxe room for 2) which is decent but a little musky. 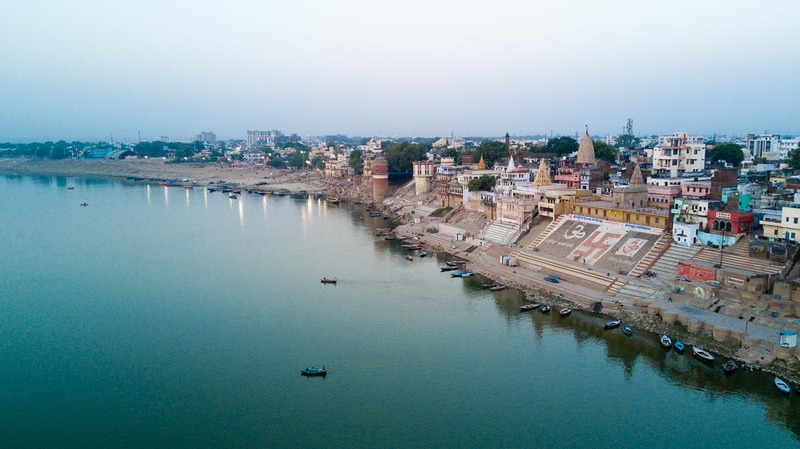 Varanasi – Agra – Lucknow forms the heritage arc route many history buffs love covering and while some of the top sights like the Bara Imambara and the Residency get a lot of visitors daily, tourism hasn’t quite made its run here yet so you can visit most places without having to struggle through the crowds. 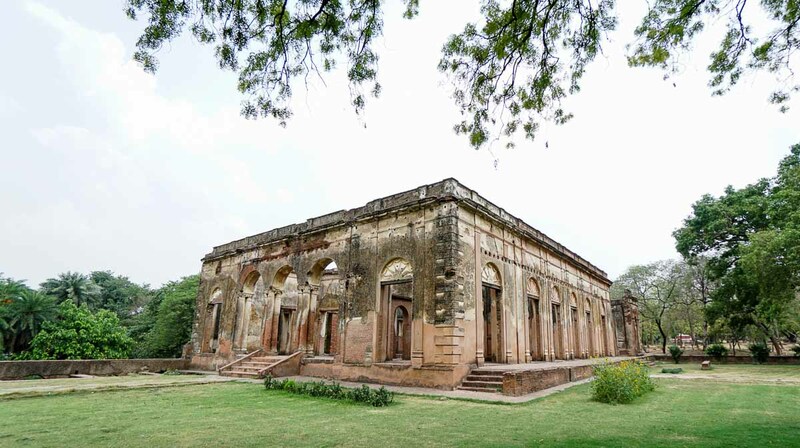 Built in the 1800s, this collection of ruins was home to the British until the Lucknow uprising in 1857. Walk through what’s left of the buildings and you’ll spot gunshots and canon dents leaving their mark around the compound. If you’re there in a particularly hot day, the museum is a good refuge with more information of the area. 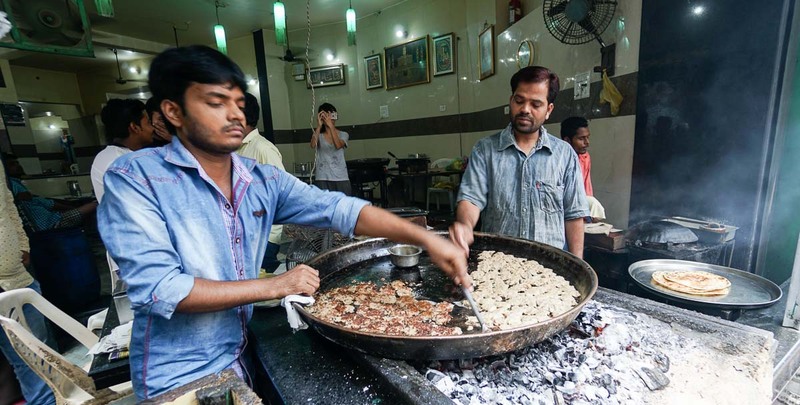 Located on Mahatma Gandhi Road — one of the busiest streets in Lucknow where you’ll find shopping arcades, cafes and bars — is this unassuming restaurant. 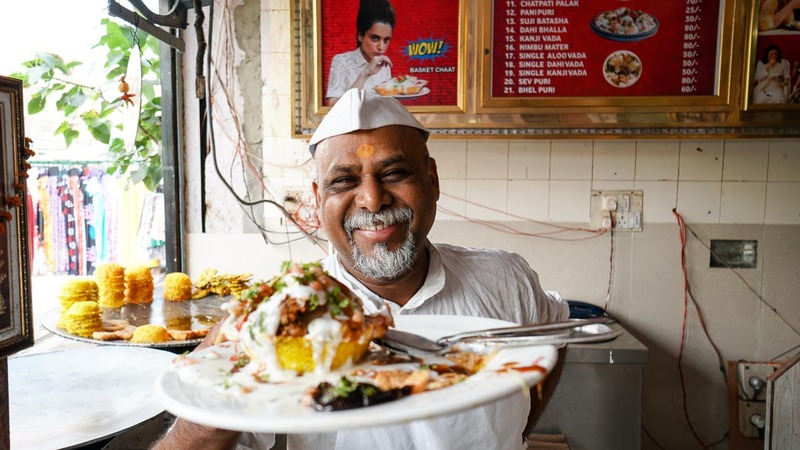 On the outside, it’s a popular chaat shop selling bite sized pooris filled with a spicy gravy. In the evenings you’ll see a queue for them. 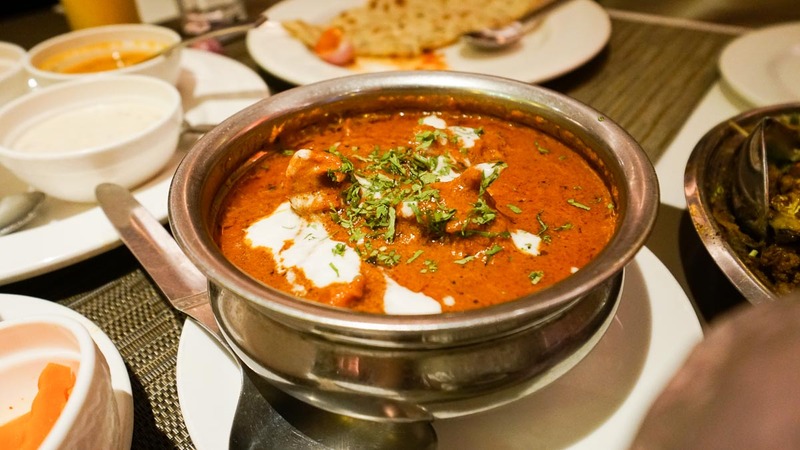 While on the inside, it’s posh, air conditioned restaurant serves delicious Indian cuisine from Briyanis, to curries for a very reasonable price. 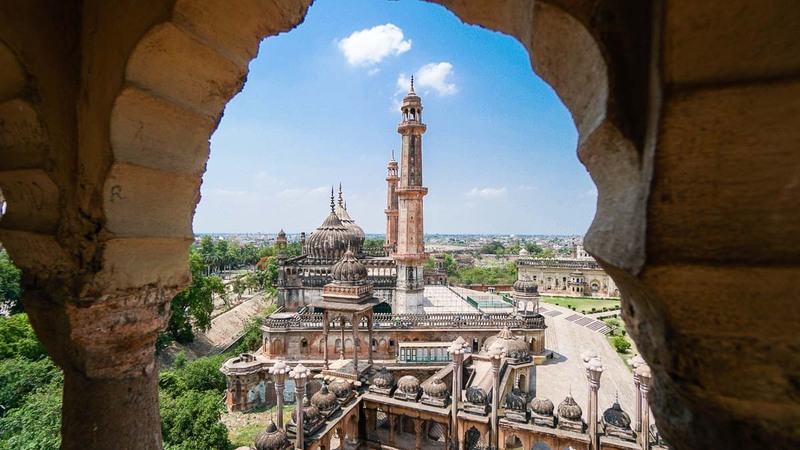 At the heart of Old Lucknow is a maze like street of old artisan shops where you can see an array of shops from witnessing a partial production of chikan embroidery sipping chai at a traditional coffee shop that sells nothing else except cups of tea. Apart from the occasional motorbikes, look out for the cows and monkeys too! Especially the latter who will attempt to share your food if it’s visible in your hands. 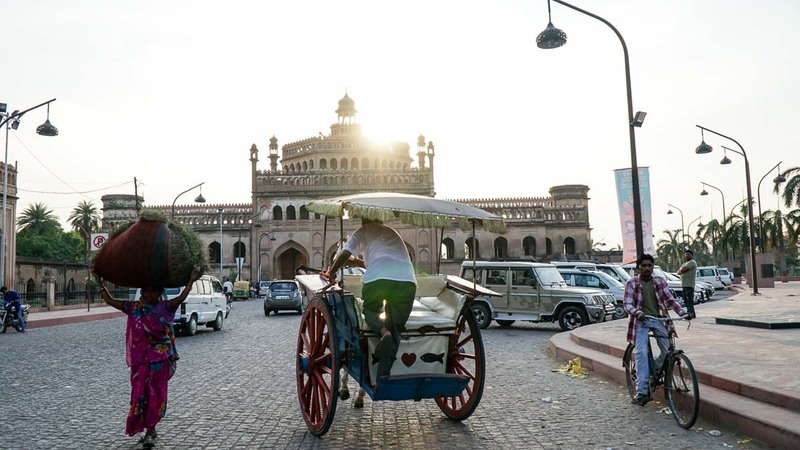 *Pro-tip: Sign up for a 2 hour walk with UP Tourism (₹300/pax) and be brought through the hidden streets of chowk as well as a brief history lesson on the other popular sites such as the Bara Imambara and Chota Imambara. Imambara means shrine and this is the largest one in Lucknow. But apart from its size, the intricate labyrinth on the top floor make this a particularly interesting site to check out. Someone once said even the the guides get lost in here but we figured that’s just a marketing tactic so foreigners would pay for a guide. It might be a little confusing but if you get lost, just try to find the top and you’ll see a flight of stairs that brings you all the way down. 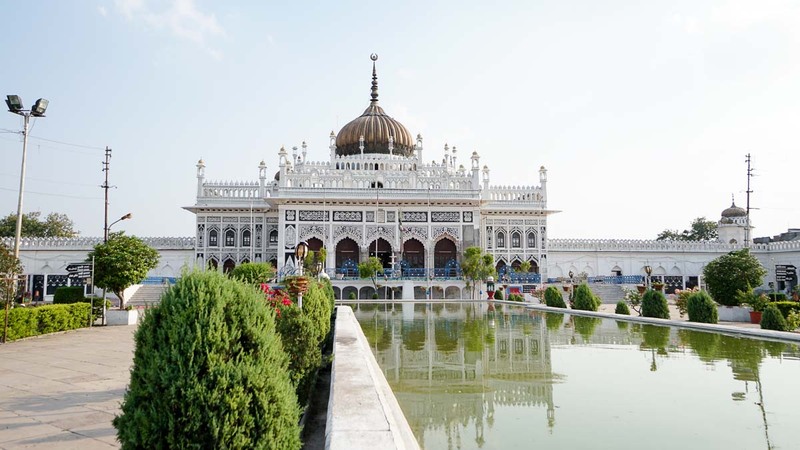 This intricate Imambara houses the bodies of Mohammed Ali Shah and his mother. In front are 2 mini replicas of the Taj Mahal, one housing Mohammed Ali Shah’s daughter and the other, her husband. Since a hundred years back, there has only been 1 item on the menu here so you can expect to be in for a treat. The kebabs here are said to have papaya added as a tenderiser, made into patties and fried in ghee which gives it a melt-in-your mouth experience. Internet may be slow or spotty in some areas so it’ll be really useful to have intercity transport information on hand. Take note of the buses and trains that leave for your next city and what time they leave. With this information, you can either book your tickets over the counter or get the accommodation to book for you via a phone call. For buses, Redbus.in offers a neat format where you can check out bus timings and whether the transport has a/c or sleeper options. 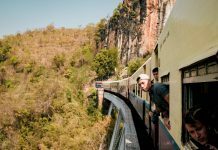 For trains, check out Cleartrip.com. Take note of the train code, date, timing and class when booking over the counter at railway stations. With this information written on a piece of paper, the staff can easily book your tickets without much hassle. 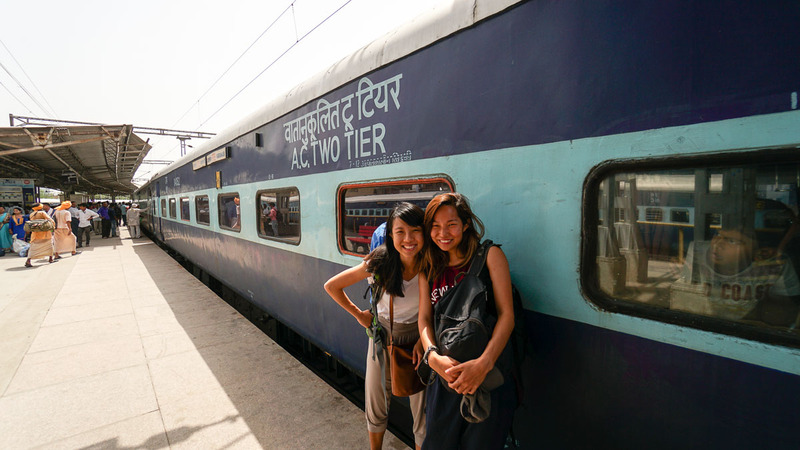 Check out our First Timer’s Guide to India for more intercity travelling tips. 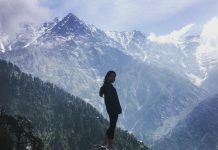 Travel plans will change a lot in India so while you don’t want to set your route in stone too early, planning for the next city will definitely help. 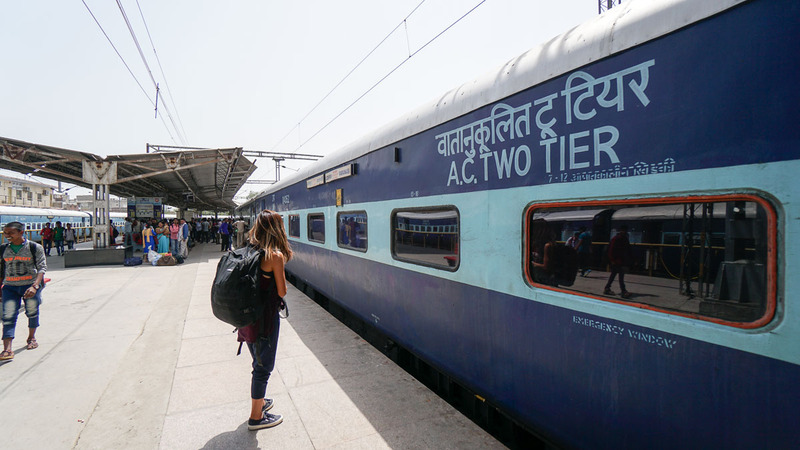 We usually make it a point after checking-in to either purchase train tickets to the next city or ask our accommodation to book us bus tickets — do expect a small commission if it’s booked through them. 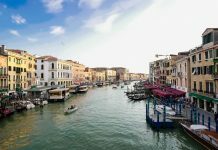 Taking from point 2, it’s good to ask the locals if they have any recommendations for where to stay in your next city but you’ll want to get it booked with its address and directions noted before leaving on your bus or train. The last thing you want is to disembark in a brand new place and find yourself overwhelmed with auto drivers asking where you want to go. If you’ve always wanted to embark on a trip like this, the best time is now! Get your flight tickets via Scoot for the most convenient way to India. This post is brought to you by Scoot. Amazing and very insightful post. You really had explored the destination wonderfully. What we did to gauge the price was to use the Ola app (their local Uber/Grab but includes autos) to search. The app will show a range for how much it costs and prices are very reasonable! With that, you have a little more bargaining power. Usually we will agree to pay a little more than the app but that’s because it saves us time — the app’s GPS isn’t very accurate and can be quite challenging to locate especially in crowded areas. Thank you very much for your information. I have plan for visiting India for next year and your information make it easy to me in trip planning. That’s an incrdible itinery for a week in india covering the majority of the places of north. Would love to see more of south and north east. Really nice blog post. Thanks for sharing this with us. It will really helpful for readers who are planning to visit these places.